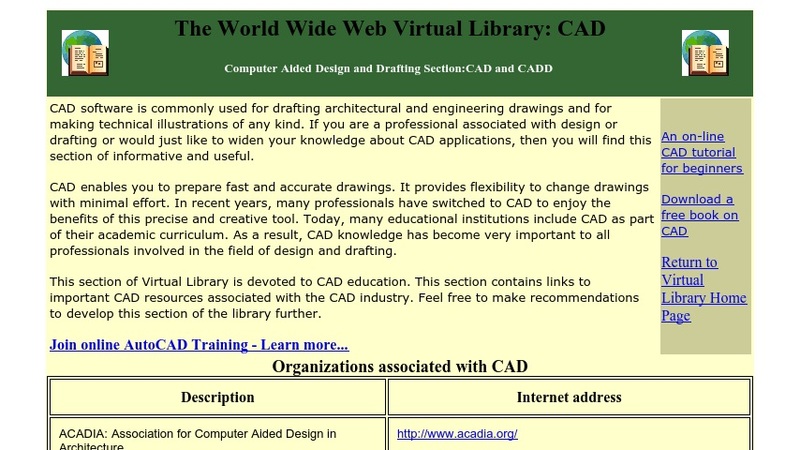 This section of Virtual Library, started by Tim Berners-Lee, provides educational resources on CAD. CAD software, used for drafting architectural and engineering drawings and for making technical illustrations in general, is widely used by engineering professionals and students. The website provides links to "important CAD resources associated with the CAD industry." The resources are organized into the following sections: Organizations Associated with CAD; CAD Research and Artificial Intelligence Links; CAD Directories, Gateways and News Centers; Important CAD Review Resources; CAD Magazines, Journals and Newsletters; and CAD Software Programs. Visitors are invited to make recommendations for additions to the library.